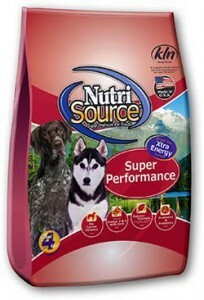 Home » Nutri Source Super Performance 40 lb. Nutri Source Super Performance 40 lb. Chicken meal, chicken, brown rice, chicken fat (preserved with mixed tocopherols and citric acid), fish meal (a source of fish oil), oatmeal, flax seed, natural turkey and chicken flavor, peas, white rice, pea fiber, sunflower oil, dried brewers yeast, dried egg product, salt, minerals (zinc proteinate, iron proteinate, copper proteinate, manganese proteinate, cobalt proteinate, selenium yeast), potassium chloride, lactic acid, vitamins (vitamin A acetate, vitamin D3 supplement, vitamin E supplement, niacin, d-calcium pantothenate, thiamine mononitrate, pyridoxine hydrochloride, riboflavin supplement, folic acid, biotin, vitamin B12 supplement), lecithin, choline chloride, glucosamine hydrochloride, L-ascorbyl-2-polyphosphate (source of vitamin C), chondroitin sulfate, yucca schidigera extract, calcium iodate, rosemary extract, yeast culture (Saccharomyces cerevisiae), dried Lactobacillus acidophilus fermentation product, dried Enterococcus faecium fermentation product, dried Aspergillus niger fermentation extract, dried Trichoderma longibrachiatum fermentation extract, dried Bacillus subtilis fermentation extract.